In recognition for the quality of the process implemented by the University of Montenegro in order to fully meet the skills and competences required to get the Certification of Academic Integrity for an Institution and for the high level of the University’s stakeholders involvement. The activity was organised within the framework of the Council of Europe Action “Strengthen Integrity and Combat Corruption in Higher Education”, which is being implemented in Montenegro within the framework of “Horizontal Facility for Western Balkans and Turkey”, jointly funded by the European Union and the Council of Europe and implemented by the Council of Europe. 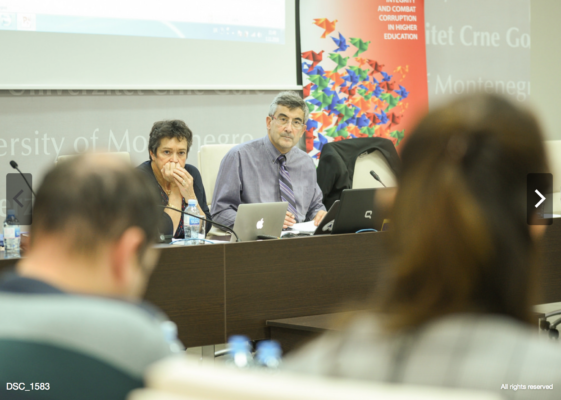 A workshop on ethical issues and approaches, integrity, anti-fraud and plagiarism was held at the University of Montenegro on 1-3 November, as a part of the institutional certification process. 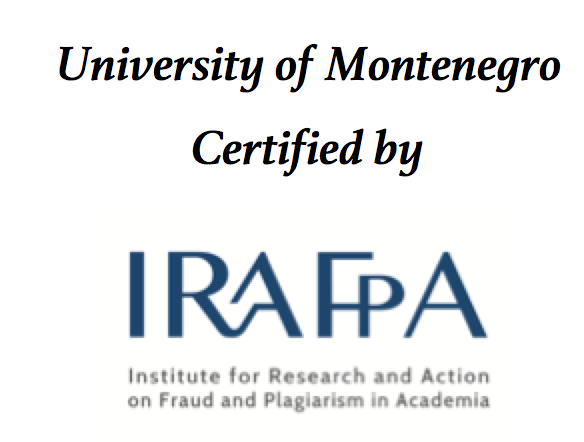 The certification process is being facilitated by the Swiss International Institute for Research and Action on Academic Fraud and Plagiarism (IRAFPA), a leading European ethics and anti-plagiarism educational centre affiliated to Geneva University. The three-day workshop was attended by 15 members of the Montenegro university`s team for academic integrity. The two experts discussed with the team the work done so far and the improvements that need to be made in order to obtain the certification. The workshop mostly covered the revision of the reference manual “Responsible Institution”. This document sets out the principles which will enable implementation of required policies and procedures in order to prevent as much as possible plagiarism and scientific fraud. The certification process was completed on February 18 2019 when a jury of 2independent experts visited the university in order to assess its level of preparedness for the certification.